Romance was at a high when Katie Lowes stepped out at the Build Studio: ‘Scandal’ event on Tuesday (January 30) to discuss the show. 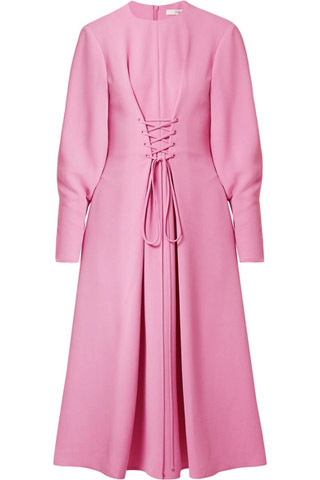 The actress’s Tibi Resort 2018 dress was full of feminine grace with its cotton candy pink hue and soft lines. Such a shade could come across as juvenile but the silhouette and waist-enhancing corset detail brought ladylike sophistication. Monica Vinader jewelry and black V-cut shoes ensured a graceful finish. If the ensemble seems familiar to you, an orange version was previously worn by Maria Sharapova. Whose outfit did you prefer?